Hello! I’m a botanist, educator and artist on a mission to bring art and science closer together. 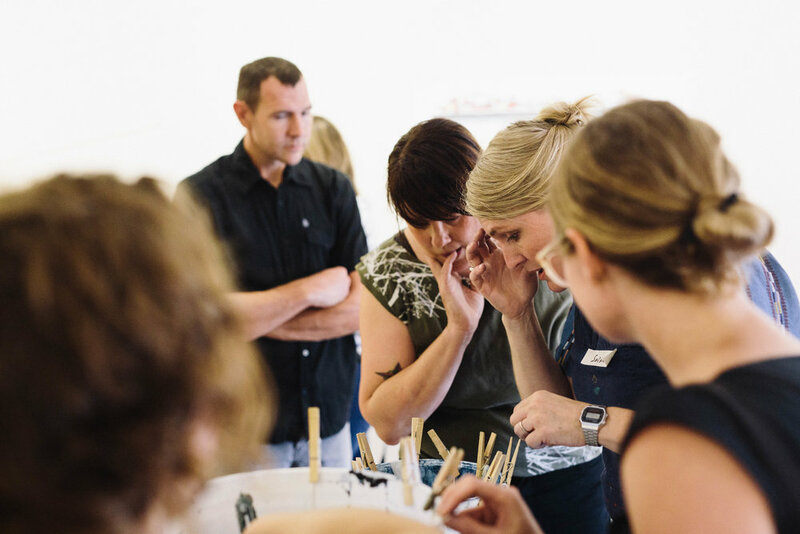 I design creative experiences that connect people to nature and place through collaborative art making. How does art connect with science? Well, they are two sides of the same coin, but somehow that got lost in the 1800’s as industrialization pushed us to specialize more and more. I believe that all people have the capacity to be artists and scientists, and that it’s critical for us to claim these abilities every day. This year, I want to help people Notice Nature Everywhere. Weaving Water is a public art project in its prototype year. 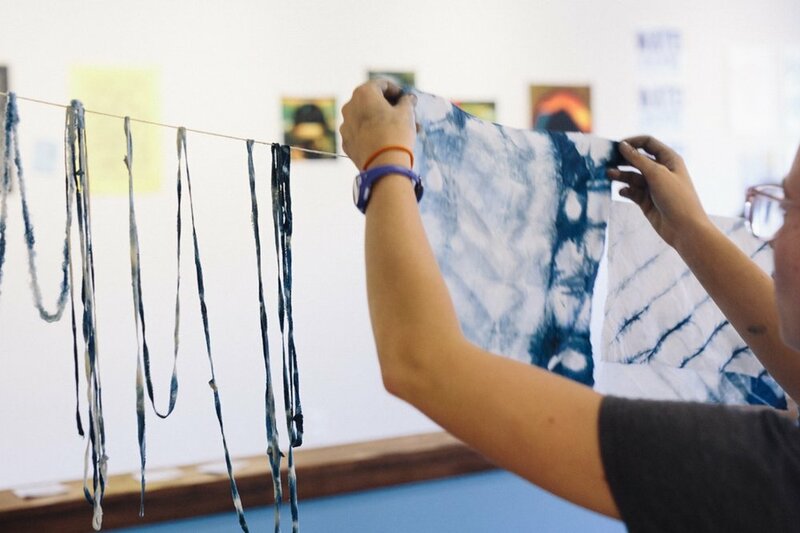 I’m exploring the ways that weaving can be incorporated in public engagement around the topic of our relationship to water. 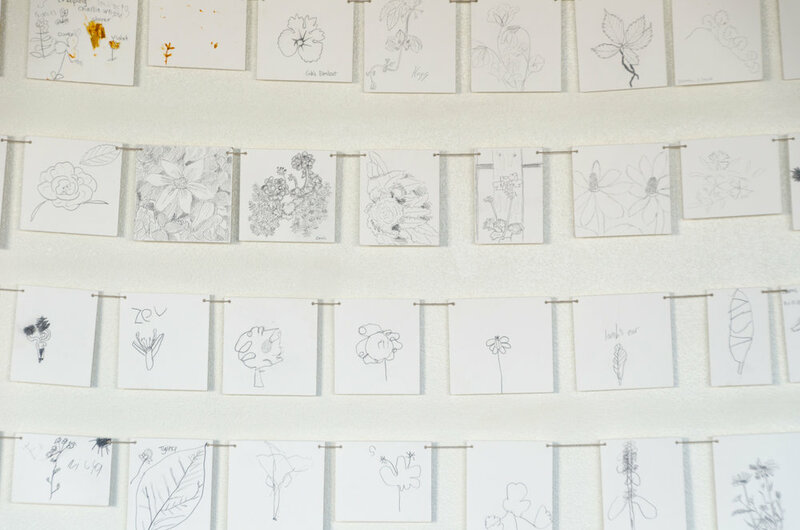 For the Urban Forest residency, students keep naturalist notebooks of their own drawings and observations. Part of Shared Ingredients, Preserving our Roots is an installation of youth drawings of root vegetables used in the cuisines of indigenous and immigrant communities of St. Paul. Part of Shared Ingredients, Companion Planting is a mural incorporating youth drawings of the three sisters --beans (omníča), corn (wamnáheza) and squash (wamnú) . The bright pink mandala pays homage to the portable flavors of home that are herbs. Did you know culinary favorites from basil to oregano belong to the mint family? Every September, the Nokomis East neighborhood hosts a bilingual celebration of the monarch butterfly’s journey between Minnesota and Mexico. I design a poster each year for 1,000’s of festival goers to print and take home. What happens when neighbors open their gardens to each other? Over the summer months, community gathered to admire and draw the gardens of residents of Prospect Park, a neighborhood in Minneapolis, MN, creating new connections through public art. I started Rectangle Designs was a line of botanically inspired fashion I produced for several years. Each design featured a botanical story about the motif. Making observations of the school forest as part of the Urban Forest Project. 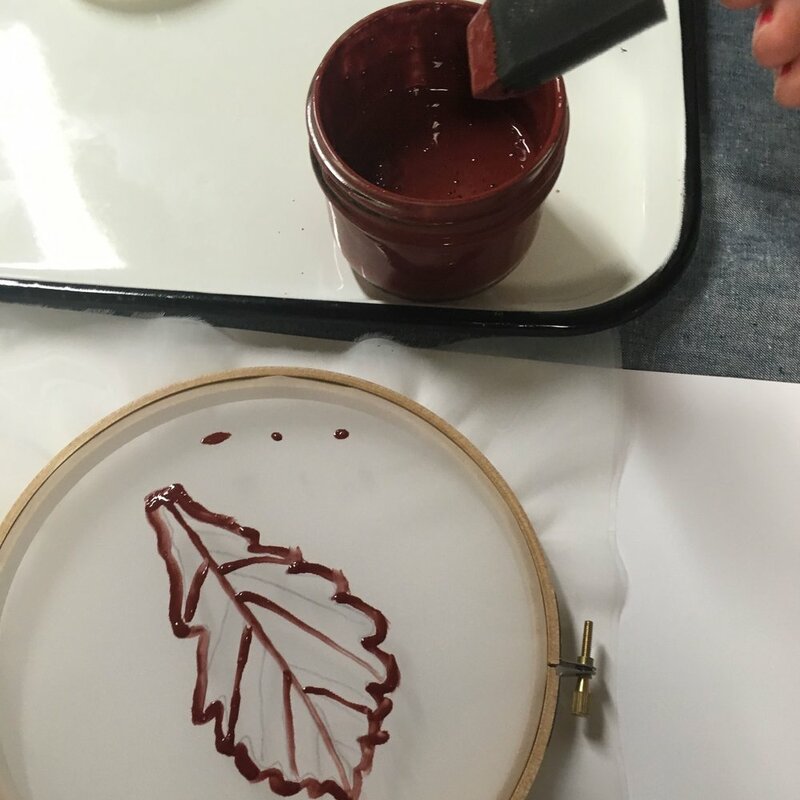 Planning the repeat of her motif, a student and partner capture the student’s observation of green ash leaf in a textile design. 1,500 free Field Books were distributed along the newly opened train line to connect riders with nature and local businesses at each train stop. Participants who signed up for free field explorations of The Other Green Line joined me on a nature walk starting at the train stop and exploring a natural history theme of the area. Public garden parties were held all summer in gardens of all kinds across the neighborhood. Participants in What We Grow admired and drew the plants of neighborhood gardens. Over 150 drawings were made of neighborhood gardens by participants. 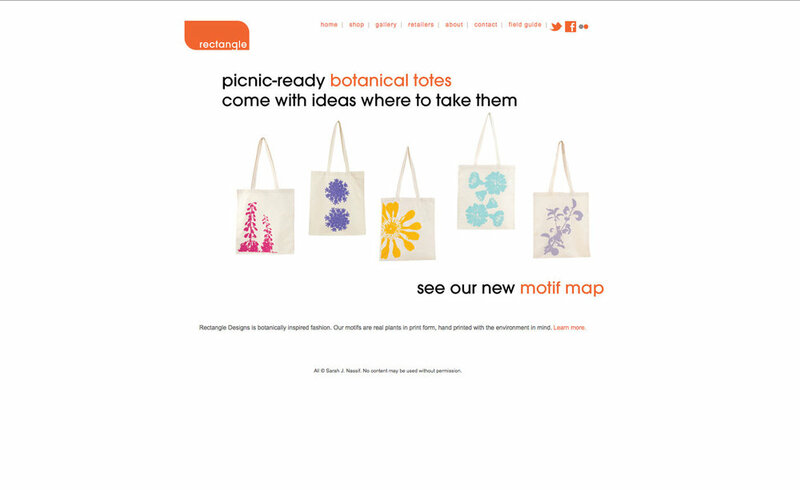 These became the motifs used to create a big picnic blanket. 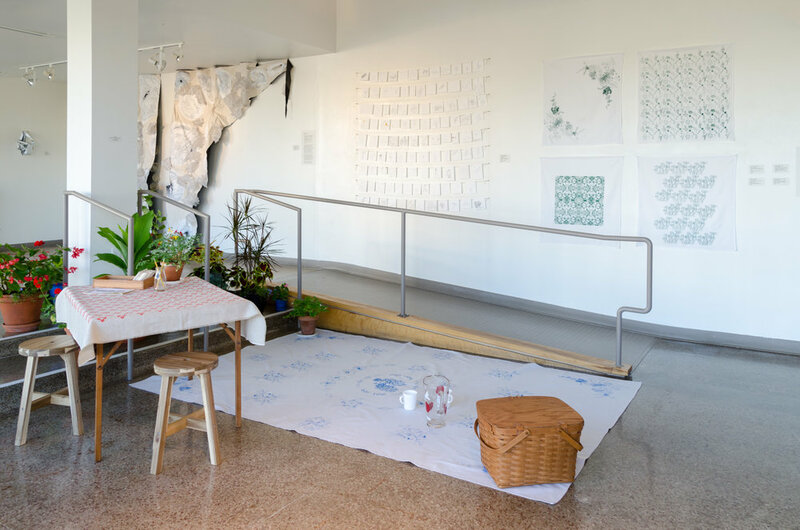 The culmination of What We Grow, a textile installation celebrating garden drawings made during the project. Teens gathered to learn about and draw a wide variety of foods. Their drawings became wall murals in a new community center. Quick Sharpie drawings resulted in bold motifs for four large murals. A to Z of ingredients used by native and immigrant cultures who have called the East Side of St. Paul home over the decades. Drawings were made by residents. From pollinator gardens to freshwater shores, I’m making art intertwined with science experiences to raise awareness, engage, and activate communities to better understand and care for the environment. Thinking about nature using a creative lens brings more people into the conversation about how we as humans understand and rely on the natural world for our survival. Select projects filed under work. Welcome Danny Seo fans! Go behind the scenes of my day with Danny, and learn about how I came to bring art and botany together. To celebrate being on Naturally, Danny Seo, I am making 100 tees of my 2019 motto. It’s an invitation to appreciate nature where ever we may be, even parking lots and bus stops. Design and print your own leaf motif! Simple steps and plenty of photos guide you through from start to finish. Here I am “back stage” with Danny Seo in downtown Minneapolis. Watch the episode January 19, 2019!